Drill louvers as usual for louver pins. Slot one side of louver with router mounted under the table. 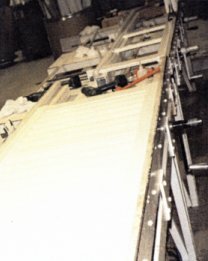 Guide for 3 1/2" louvers (shown) - moves to adapt for 4 1/2" louvers. SLOT is formed in louver. AV101-SP-M in opposite side of slot. 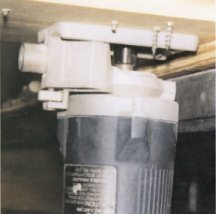 Two piece tension pin for Poly or AV106-TP hooked tension pin for wood may be needed. non-ferrus metal - 80 tooth blade. cut to length as shown. Ultra Clear® panel with a divider rail. 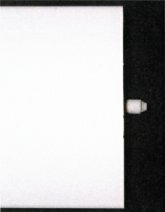 Note: This notch in the divider rail allows the entire Ultra Clear® panel to move up and down when using a divider rail. (make sure glue does not get into Ultra Clear® mechanism). 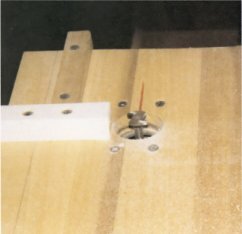 position and glue rail to stiles. hole in the hole strips to eliminate hang up - 9/32"
AVI - Plastic insert adapters. then install AVI 1/2" plastic insert. children's room for easy access for children's reach. Note: Cut louver where pull is to be placed = 0.082" thinner. Ultra Clear® "Transitional Shutter" is made. Retail customers are paying an estimated $40-$50 per panel more for easy to clean - Ultra Clear® shutters!! !